Photographed by Frances McLaughlin-Gill, 1952. Vera Maxwell is another nearly forgotten designer from the same 1940’s period as McCardell, Cashin, and Hawes. Similar to their ideas, her fashion philosophy involved her designs being both fashionable and functional. According to a 1964 New York Times article, Maxwell’s clothes were described as “handsome, interesting, and eminently wearable”. Maxwell came to fashion in a unique way because she was a showroom model first. Her individual style and her homemade garments were noticed and then sought out by department stores Lord & Taylor and Best Co. Interestingly, her first real fashion job was with Alder & Alder in 1936, where Bonnie Cashin had also once worked. She joined Brows, Jacobson & Linde in 1937 to design activewear for sports such as skiing and horseback riding and eventually, in 1947, she went into business for herself under the name of Vera Maxwell Originals. Besides activewear, during WWII she began designing more utilitarian items like the coveralls she created for female factory workers at the Sperry Gyroscope Corporation. She considered them to be the first jumpsuits for women. The coveralls were not the only uniform-like garment that Maxwell would design. 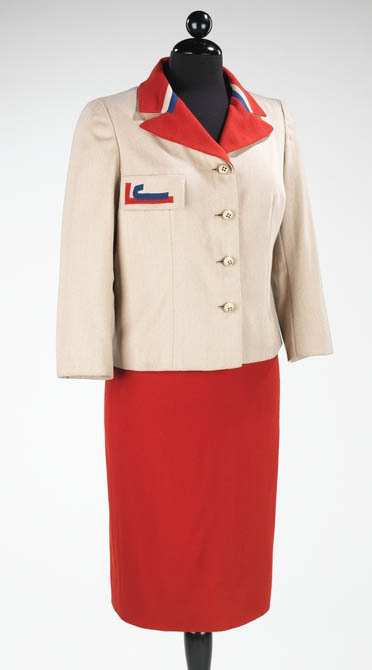 In fact, she was responsible for the design of many uniforms that were put into use by the military and by the service industry, such as her design for the Lincoln Center docent uniforms. Her more fashionable designs were similar to these uniforms by the fact that they also had a practical purpose. One of her favored creations was the travel suit. Usually made of comfortable wool jersey, the suit had separate pieces that could be intermixed to make travel packing easier. 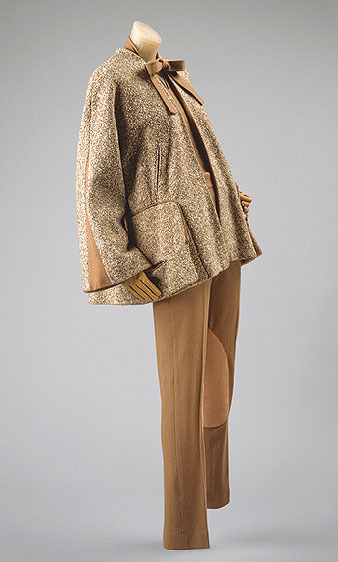 As she said, “Clothes should be beautiful, adaptable and sound.” She would continue to create variations on the travel suit throughout her career. 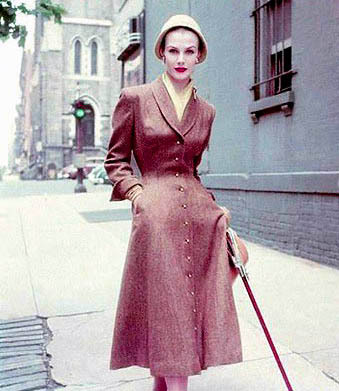 Wool, silk, and leather travel suit, 1948. 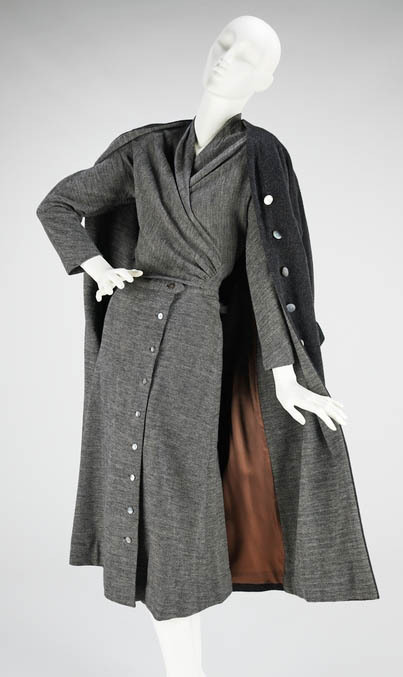 Especially designed for traveling, this particular suit consisted of an Irish tweed coat with a large pocket lined in plastic with zippered compartments meant to carry washcloths and a toothbrush. Worn with a coordinating blouse and pants in wool jersey, one would be ready to go straight from the plane after a convenient freshening up. 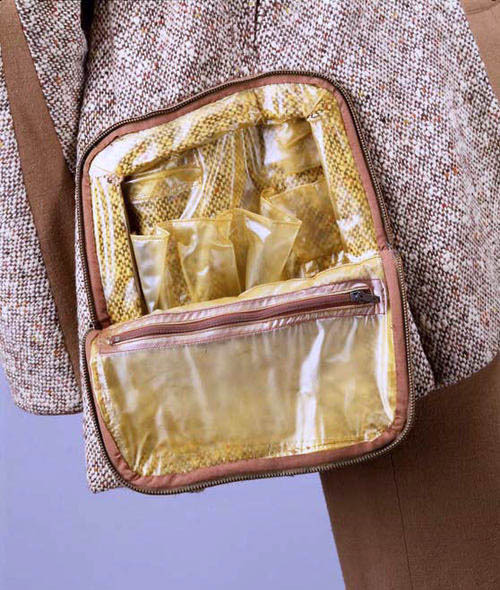 Close-up of the purse pocket, 1948. 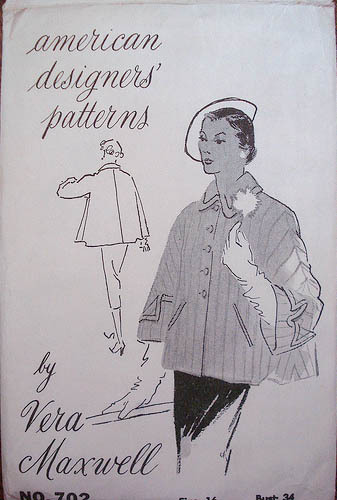 Home Sewing connection: Vera Maxwell designed a few patterns for the Spadea American Designer pattern label in the 1950s. 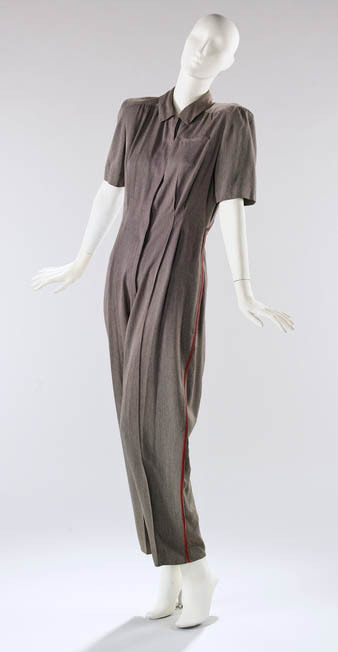 Painted tussah silk ensemble, 1962. She designed several female war worker uniforms in the early 1940s. Maxwell has been given two retrospectives; one at the Smithsonian Institution in 1970 and one at the Museum of the City of New York in 1978. In 1971, she was one of the first designers to heavily invest in a new material from Japan called Ultrasuede. The fabric became linked to her designs. Before becoming a model, she danced with the Metropolitan Opera Ballet from 1919 to 1924. She was personal friends with Princess Grace and Prince Rainier of Monaco after meeting at a fashion awards show. Images: Brooklyn Museum Costume Collection at The Metropolitan Museum of Art. Sources: Who’s Who in Fashion (2008) Anne Stegemeyer; 1995 Obituary, New York Times. I can see how she was friends with Princess Grace. Funny, how I instantly associated her with uniforms when I saw that first picture. This was before I read the story. Speaking of uniforms, I watched a Mad Men episode last night and got to see the TWA uniform up close. So pretty and feminine, especially with that hat and gloves. Thanks so much for doing these profiles! I am woefully ignorant of many vintage designers, so these posts are a great education. These posts about american designers have been delightful. Thank you! Oh man. The dress from the ‘wool ensemble’ is just lovely! I’m glad other people are enjoying the designer series as much as I am. It’s really fun reading about this fascinating group of people. Thanks for all your amazing posts… education and creativity… SO grateful to you!